In the Finger Lakes region, expect near peak conditions in Chemung County this weekend with 70-75 percent color change. There is a bright mix of yellow and orange leaves, with reds developing quickly. Spotters are noting significant leaf droppage. Seneca County will be approaching midpoint of change this weekend with 50 percent color transition and an average mixture of green and yellow leaves along with hints of red starting to appear. In Tioga County, Owego spotters expect 50 percent color transition with green, brown and yellow leaves. Leaf peepers in Cortland County predict 45 percent color change with red, yellow and green leaves of average brilliance and foliage at midpoint of change. In Rochester 40-50 percent color change is expected this weekend with fall colors of yellow, yellow-green, red, dark red and russet. Trees that normally turn yellow (some maples, yellow birch, ginkgo, and horse chestnut) are curiously remaining green to light green or green-yellow, but there is still enough color change to enjoy the fall outdoors. Spotters reporting from north of Rochester, near Lake Ontario, expect 15-20 percent color change this weekend as more trees in the area are starting to display mostly muted shades of yellow in their leaves and a few more are giving off touches of red or rust. Green still is the predominant color. In Yates County look for up to 40 percent change and midpoint conditions this weekend with orange, light yellow, and some red leaves of average brilliance. In Steuben County look for foliage to be at midpoint of change this weekend with 40 percent transition and gold, yellow and orange fall colors of average brilliance. Look for 35 percent color change and foliage at midpoint in Ontario County. Average to bright shades of orange and brown are interspersed with the dominant green, along with occasional pockets of yellow and red. In Auburn, Cayuga County spotters expect 25 percent color change this weekend with touches of orange, red and yellow leaves of average brilliance. 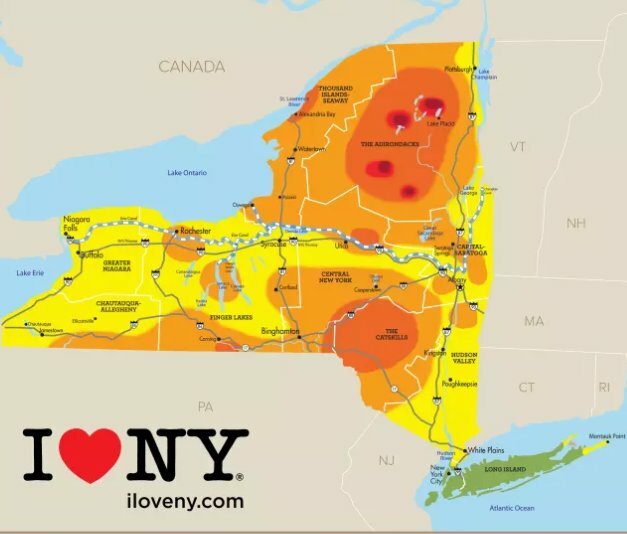 Livingston County foliage spotters in Geneseo expect 25 percent color change with crimson and burgundy leaves of average brilliance in the higher elevations, and yellow leaves with bursts of red around the lakeshores. Foliage spotters reporting from the western suburbs of Syracuse expect 25 percent color change with green leaves still dominating the landscape, but noticeable changes taking place as yellow leaves begin to color the hillsides surrounding the city. Spotters checking in from the Syracuse University campus predict just 15 percent change for the city this weekend with touches of yellow and orange leaves of average brilliance. In Schuyler County, foliage reporters in Watkins Glen expect 20 percent color change with yellow leaves of average brilliance coming on strong, along with red and orange leaves. Tompkins County foliage spotters in Ithaca expect 20 percent color change with touches of red, purple, yellow and orange leaves of average brilliance starting to appear.